according to international weather and climate authorities, 2017 marked the second or third-highest mean global air temperature reached in recorded history. NOAA reports that average global temperature across land and ocean surface areas was 0.84°C (1.51°F) above the 20th century average of 13.9°C (57.0°F) in 2017, ranking behind 2016’s record high(+0.94°C / +1.69°F) and second-ranked 2015 (+0.90°C / +1.62°F). Notably, 2017 was also the warmest year without an El Niño event occurring in the tropical Pacific Ocean. Continuing a long-term warming trend, mean, global ocean temperature set a new, all-time recorded high, according to recently released climate research from scientists working at the Chinese Academy of Sciences’ International Center for Climate and Environmental Sciences. The upper 2000 meters ( 6562 ft.) of the oceans were 1.51 x 10^22 joules warmer last year than in 2016, surpassing 2015’s previous record-high. Putting this into some perspective, that’s 699 times more energy (in the form of heat) added to the oceans in 2017 than all the electricity generated in China in 2016 – 0.00216 x10^22 joules, – Lijing Cheng and Jiang Zhu reported in their research paper. From a longer-term perspective, global mean ocean temperature was 19.19 x 10^22 above the 1981-2010 climatological reference period, the two climate scientists determined. The ongoing rise in human greenhouse gas emissions, which also rose to a new record-high in 2017, is fueling the rise, they highlight. The last five years have been the five warmest years in terms of ocean temperature, the study authors highlight. 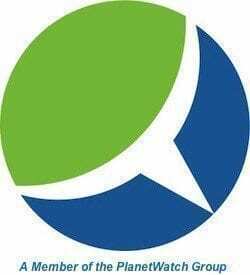 The results also support a provisional announcement made in November 2017 by the UN World Meteorological Organization that “Global ocean heat content in 2017 has been at or near record high levels,” Cheng and Zhu note. The oceans serve as the largest modulator of climate on the planet, absorbing some 90 percent of Earth’s residual heat that results from the rising trend in global temperatures. “As such, the global ocean heat content record robustly represents the signature of global warming and is impacted less by weather-related noise and climate variability such as El Niño and La Niña events,” the study authors write. “Measurements of ocean heating are a more reliable indicator than atmospheric measurements for tracking the vital signs of the health of the planet, ” the climate scientists point out. Drilling down into the data, temperatures rose most in the Atlantic and Southern oceans. 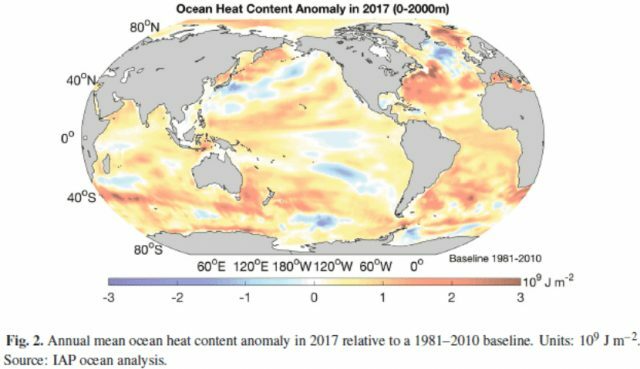 North of 30°S, 4.87 x 10^22 joules of heat energy was added in the Atlantic Ocean, while 7.36 x 10^22 joules were added in the Southern Ocean in 2017. The volume of water in the oceans is expanding as ocean temperatures rise. 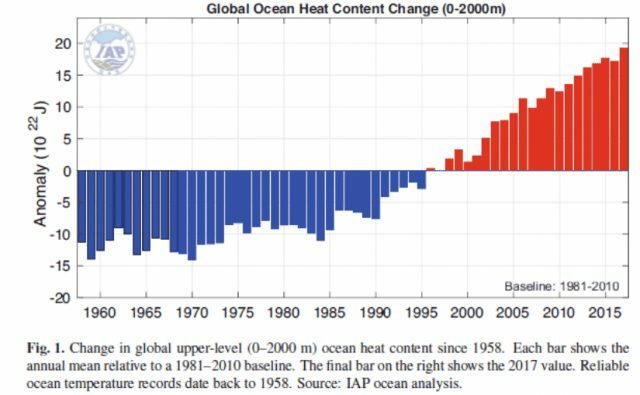 The increase of 1.51 x 10^22 joules of heat energy added to the oceans last year contributed to a 1.7 millimeter (0.067 in.) rise in global mean sea level, according to the study. Warmer ocean waters are also contributing to the depletion of oxygen and hence biological productivity and health. They also result in increased coral bleaching and melting of sea ice and ice shelves. All of this appears to be creating a self-sustaining, negative feedback spiral, raising the specter that some of scientists’ worst climate change scenarios may come to pass.